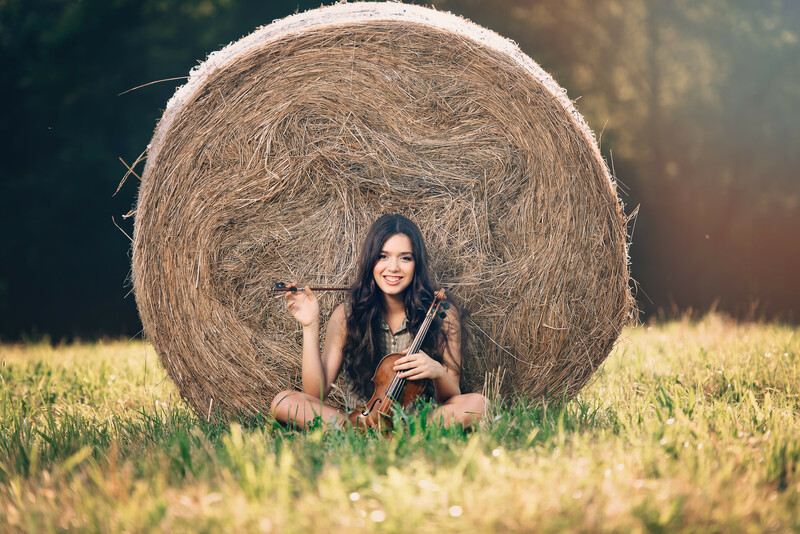 Laureate at the 59th Kocian International Violin Competition in Ústí nad Orlicí in Czech Republic, Lucilla Rose Mariotti is a seventeen-year-old Italian violinist. In 2017 she has also won other two competitions in Czech Republic: she has become Laureate at the Josef Muzika International Violin Competition in Nová Paka receiving the prize for the best performance of the contemporary Czech piece "Dža More" by Sylvia Bodorova and she has won the 1st prize in the Josef Micka International Violin Competition in the 5th category in Prague, receiving also "The PhDr. Josef Micka Award". In 2018 she has played the Violin Concerto in E minor op. 64 by Mendelssohn with the Czech Chamber Philharmonic Orchestra Pardubice under the baton of Maestro David Švec at the Kocian Festival and the Violin Concerto op 35 by Tchaikovsky at the International Festival in Kroměříž under the baton of Maestro Tomas Netopil. Moreover as a prizewinner of the competition organized by the New York International Artists Association (NYIAA) she has performed in the Weill Recital Hall of the Canergie Hall in New York. She has also been awarded the 1st Duke of Devonshire Award for the best performance by competitors under the age of 18 and the Cox Memorial Memorial Prize at the ESO 31st Young Soloist Competition 2018 in Eastbourne (United Kingdom). Besides these accomplishments, she has been awarded the absolute first prize in more than 40 competitions, national as well as international. In particular it is worth mentioning that in 2013 she received a special mention by Sony Classical Talent Scout in the category “Classical Kids” at Festival of Culture in Bergamo, in 2015 she has won the prize "Renzo Mantero" receiving a scholarship for the best performance of a romantic concert at "Città di Castel San Giovanni” and in 2016 she has won the Violin Competition "Pellegrino da Montechiaro" in the category without limit of age receiving the special prize of the public. She has also won “Salieri Young Prize" in Legnago and the first Prize in the International Music Competition 'London' and 'Salzburg' Grand Prize Virtuoso 2016 playing in the Wiener Saal Mozarteum in Salzburg. At the International Violin Competition “Andrea Postacchini” in Fermo she received a scholarship in category B. At 28th edition of "European Music Competition Città di Moncalieri" she won the absolute first prize in the category “Soloist with Orchestra” (violin/piano category up to 35 years) playing the Concerto n°5 in A major K 219 by Mozart with the "Orchestra Classica di Alessandria". In 2018 she has also recorded at Trafalgar Recording Studios in Rome thanks to Musikstrasse and Campus delle Arti Association. At 9 years old she gave her first performance as soloist with an orchestra and since then she has performed in concerts and recitals accompanied by orchestra, chamber music ensembles and piano in Italy and also abroad (San Marino, Austria, Germany, Czech Republic, Belgium, United Kingdom and New York). In particular she has performed in Milan at Brera Museum during EXPO 2015, at Museum Piaggio Foundation in collaboration with Fonè Music Label, in Florence with the Florence Symphonietta, at the Francigena International Arts Festival with the Francigena Chamber Orchestra, in Teatro Dario Fo in Camponogara near Venice with Note Future Chamber Orchestra and at Villa Lante al Gianicolo in Rome thanks to Musicaimmagine Association in collaboration with Institutum Romanum Finlandiae. Some of her performances have been broadcasted by the Vatican Radio, the Czech Radio and by Venice Classic Radio . She has also taken part in the TV show "Prodigi 2017: La Musica è Vita" on RAI 1 sponsored by UNICEF Italia. Lucilla Rose was born in 2001 and began her violin studies at age 5 with Nicoletta Del Carlo, Edoardo Oddone and Alberto Bologni. Since the age of 8 she has been studying with Marco Fornaciari. She is also studying with Maurizio Sciarretta in the String Department of Imola Music Accademy and with Mark Messenger (Royal College in London). She attends also some lessons by Jiří Fišer and has taken part in the Václav Hudeček Academy in Czech Republic.